Figure Friendly Gobi Manchurian ! Figure Friendly, sweet and sour, tangy and spicy Gobi Manchurian ! 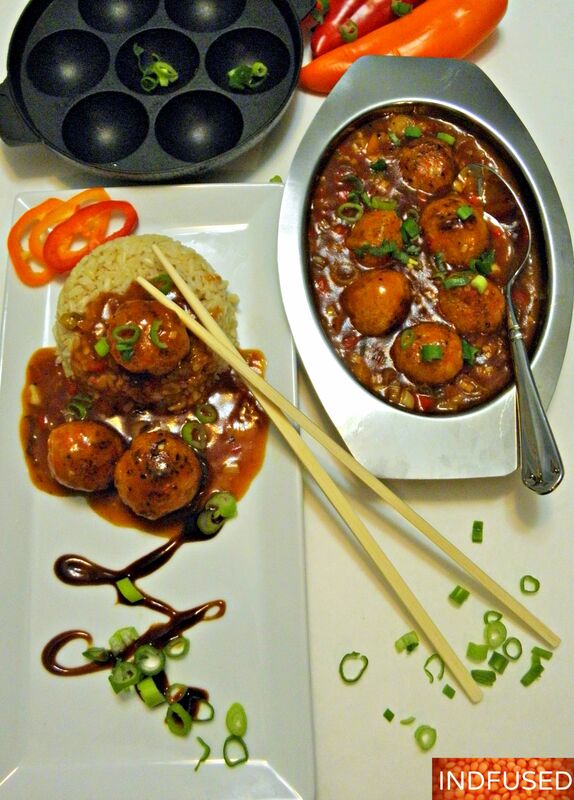 Grab a plate and chopsticks for some sweet and sour, tangy and spicy Gobi Manchurian with brown rice! Then it is time to dust off the aape pan and enjoy Gobi Manchurian, sans the guilt ! 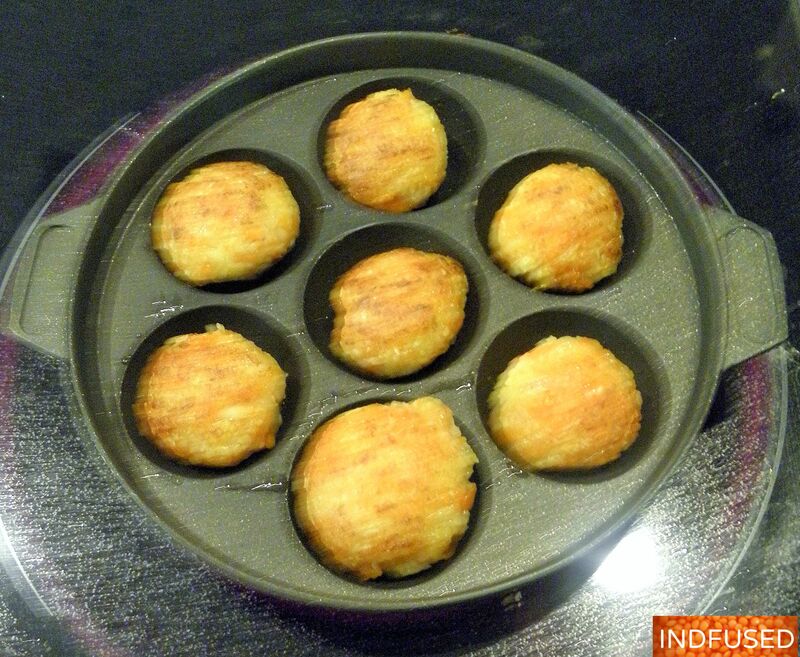 Aape pans are stove top muffin or popover pans that are available in Asian markets. Coincidentally, I had bought my first cast iron aape pan in Chinatown but later got a nonstick one made by the Indian brand, Anjali. The veggie balls cooked perfectly in this aape pan with a crispy texture on the outside and with just a couple of drops of oil! The Manchurian dishes are believed to have evolved in India and are a harmonious marriage between the Indian and Chinese cuisines. Gobi Manchurian is super popular among the young and old alike. It is served as ‘dry Gobi Manchurian’, which is an appetizer with the sauce just coating the veggie balls or with sauce/gravy and served with rice. I chose the latter and served it with brown rice. The base for the Manchurian sauce is typically a combination of soy sauce, tomato sauce and hot sauce with aromatics such as ginger and garlic. I add toasted sesame oil and hoisin sauce in my recipe because I love the deep flavor it lends to the sauce. So are you ready for some figure friendly, sweet and sour, tangy and spicy, Gobi Manchurian this weekend? My recipe below, using the food processor and microwave, makes it a quick and easy to have for lunch or dinner. I started with cooking the brown rice in the rice cooker and by the time the rice was cooked, the Gobi Manchurian was ready to be devoured! ½ cup diced capsicum or green pepper. I used the red and orange peppers for their gorgeous colors. 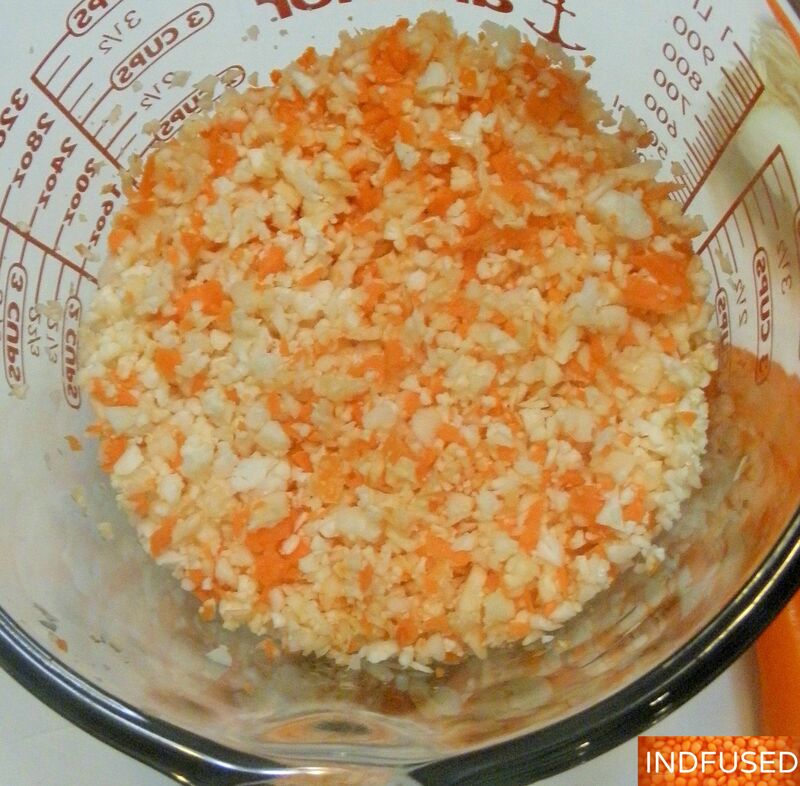 In a microwave safe bowl, combine the minced cauliflower and carrots with the grated ginger and garlic and the sea salt. Microwave the mixture for 1 minute on high. Remove from microwave. Add the ½ teaspoon of soy sauce and mix. Add the corn flour, a little at a time, just until it comes together in small clumps. The corn flour thickens in a minute or two, making it easier to form the balls. Heat the aape pan on medium heat. Add 1~ 2 drops of oil per indentation and add the Gobi balls to it. Let them cook on low to medium heat until they are golden brown on the outside and cooked through about 2 to 3 minutes. Turn them to brown the other side, for another 2 minutes, adding a drop of oil, if needed. Repeat until all mixture is used up. Set the cooked Gobi balls aside. For the gravy/sauce- combine the soy sauce, hot sauce, 1 tablespoon ketchup, black or white pepper, brown sugar corn flour, water and salt. Mix well so there are no lumps. Heat both the oils over medium high heat. Add the white part of the scallions, minced ginger and garlic, serrano pepper and capsicum and stir fry for just a minute or so to release the aroma of the aromatics. Add the corn flour mixture and let the mixture come to a boil. Simmer over low heat. You will see the sauce darken in color and thicken as it simmers. Stir in the hoisin sauce and 2 tablespoons of ketchup, and add the gobi balls. Let it simmer for an additional two minutes, or until the sauce is velvety and shiny and coats the back of a spoon. Sprinkle with the green parts of the chopped scallion.Serve with rice or noodles! Hope you all enjoy this special figure friendly treat this weekend! I also make Chicken Manchurian with cooked ground chicken replacing the cauliflower and carrots! I am taking my Gobi Manchurian to Fiesta Friday, hosted by the ever gracious and accomplished Angie and co-hosted this week by the gifted and talented duo, Loretta of Safari of the Mind and Jess of Cooking is my Sport. Do join the party and check out their awe inspiring blogs ! Summer Picnic with Bhel in a Bag and Chutney and Cucumber Sandwiches! Got to try this! I have most of the ingredients and a couple appe pans so might get it done this weekend. Looking forward to it! Thanks Greg! Do let me know how you like it. I am impressed that you have the appe pans in addition to that coconut scraper! Are you on pinterest? I will add you to my indo Chinese board! Pin it there! I have added you to couple of my boards on pinterest Sandhya. And have started following you. Thanks Sonal. I will get to it soon. You have to teach me how to keep up with social media! Thanks Anjali. We both love Indo Chinese, right? These sound wonderful and I would love to give them a try, although will have to make do without an appe pan which I still have not found. One question though – is that cornstarch or cornmeal, since both are sometimes referred to as corn flour? By the way, I made your watermelon pizza recipe and it was a great hit at the party I took it too. It made me quite the star, so thanks for that. Thank you so much Hilda! I am so touched by your kind words and so happy to hear that the watermelon pizza was a hit! Great question about the corn flour- I used corn starch. Btw, I saw the appe pans on amazon but am not sure of the quality. Looks really good. I have never seen this before. Will try but I have to look into the pan. thanks for sharing! Ok I will go look! Thanks Swapna!They are super easy to make too. Linda, love your blog and will visit it soon again! I have also liked your FB page. My page is Indfused on FB too. So happy to connect with you too Linda! Yum! I want to make these now! Thanks! They are super easy and super quick to make! I haven’t had this in so long! Looks delicious, I’m drooling! Thanks Whitney! It is a quick and easy recipe-so you can have it soon. I want to make the chicken Manchurian now. These meatballs look so good! It’s great to learn the trick of adding minced cauliflower and carrots to the meatballs. They are so tasty and healthy too! I don’t think I’ve ever had anything like this, but it looks so good! Thanks for sharing. Thank you Marie. This is one of the Indian Chinese fusion dishes, very popular In India and some Indian restaurants here. Gobi Manchurian looks absolutely scrumptious! Appe pan is definitely a boon for us! Thank you Priya! Yes I agree about the aape pan! Loved your version with appefied Manchurian balls…I must try this soon! Nitali, I am going crazy with my aape pan. another recipe with aape pan today. I read in your post that it is raining a lot in Pune, so the garma garam manchurian will be great. I loved the cookies you posted- the ghee version sounds droolicious! I could eat all of it right now! Great recipe. Would love to try. Do you use use nonstick appe pan or cast iorn? Ashwini, I have one non stick aape and another seasoned cast iron one so I use both. For this one, I had used the non-stick one. These look delicious! One question, I don’t like to cook in the microwave, do you think it would work to steam the carrots and cauliflower before grating, rather than microwaving? I don’t have an aape pan, but I do have an ebelskiver which looks almost identical, so I’m going to try with that. Yes, you can steam the carrots and cauliflower. Do let me know how you like it.